Italy, and the Spring, and first love – all together should suffice to make the gloomiest person happy. It was late morning on New Year’s eve day as our high speed Trenitalia, which was traveling at over 220 miles per hour, came to a hault. 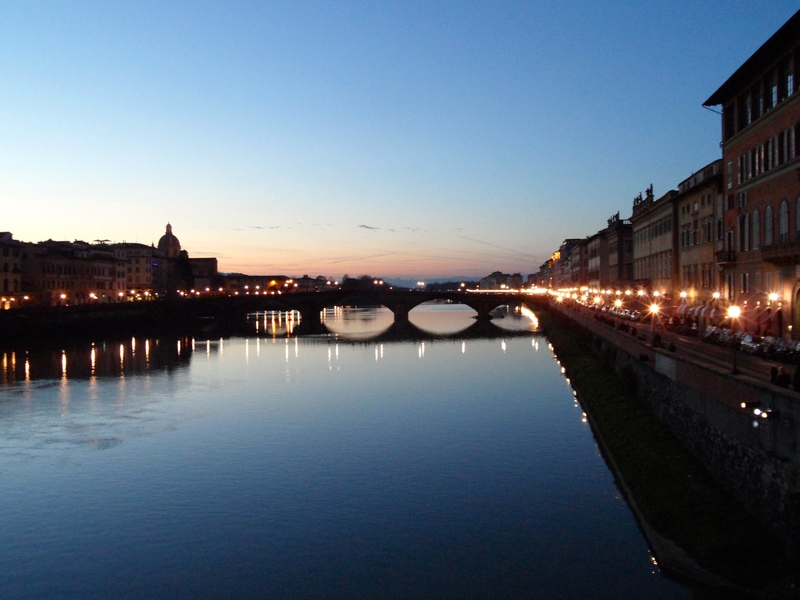 We had arrived in the romantic and iconic Florence, Italy – also known as Firenze. 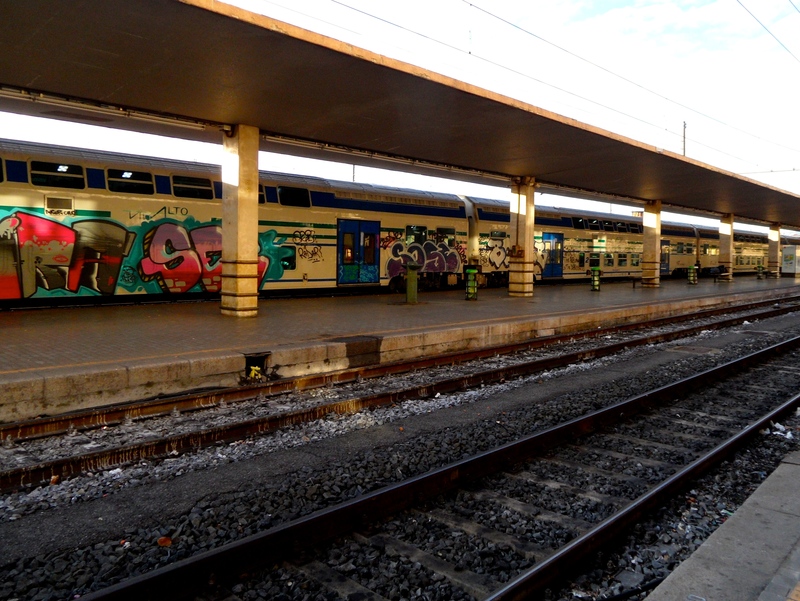 It was a cold and sunny winter day, colorful graffiti decorated the walls and tunnels of the train stations, representing the most brusque and modern art that adorns this fine historic city. I should mention that Kai was completely in awe just from the train ride. The Tuscan landscape is like none other. Much delightful Chianti Classico and divine tuscan cuisine also awaited us. We exited the train station and made a dash for a taxi to take us to our hotel. We were determined to make the most out of our first day in Florence, and ensure that we had a chance to find our way through the romantic streets of Florence before the New Year’s celebration began. After checking-in and getting settled in our hotel, off we went back into the center of Florence. Our first stop – the Basilica di Santa Maria de Flore – the main church of Firenze. And was it grand! The exterior is faced with marble panels in varying shades of green and pink. 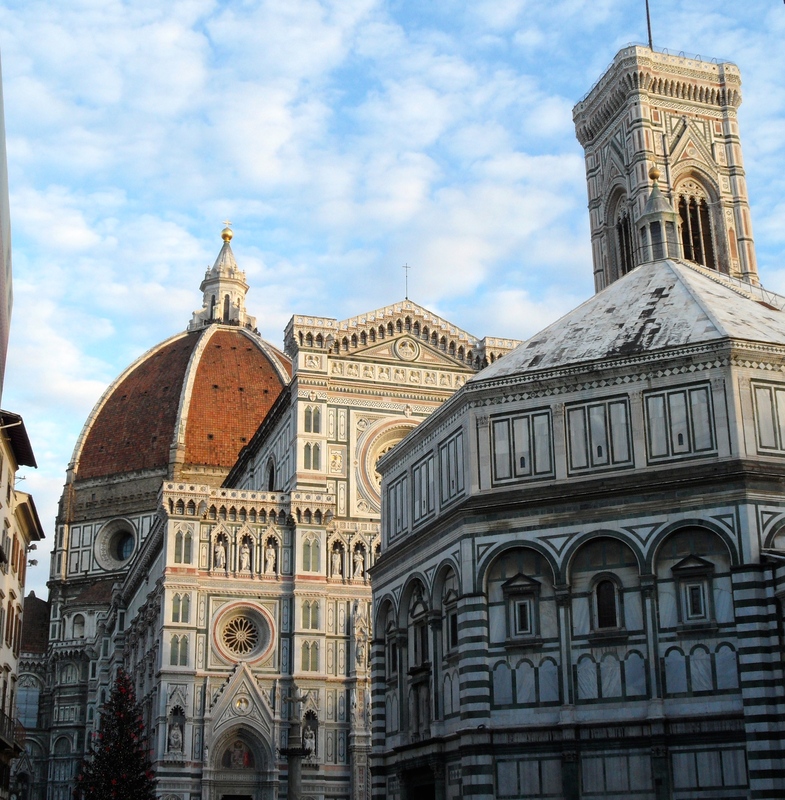 It’s duomo soars above all of the historic buildings and defines the Firenze landscape from all the hillside neighbors that surround city center. We spent hours that afternoon walking the streets, getting lost, and simply having the time of our life savoring all Firenze had to offer on New Year’s eve. Nightfall came alive in this bustling city. 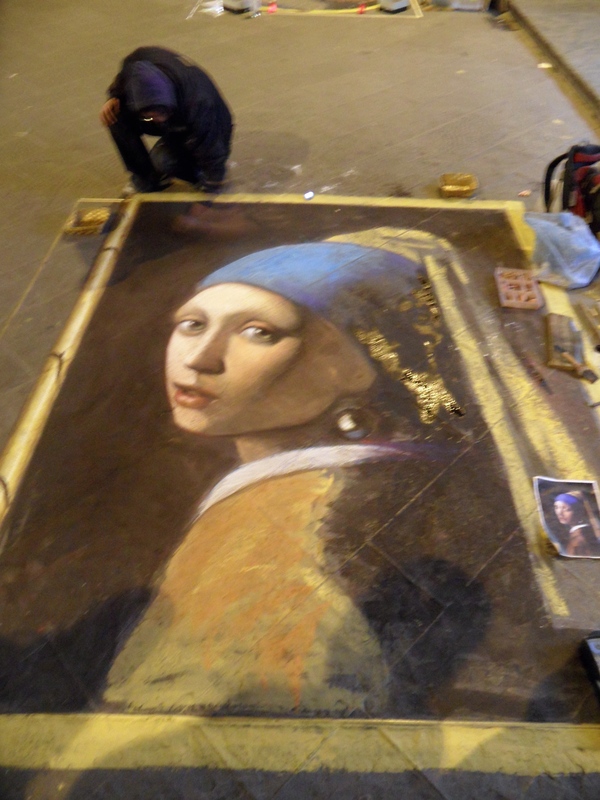 Artists painted the streets (literally) while musicians carried on. Vendors were everywhere, selling all the little light-up gadgets one can imagine. Eventually we found our way to a great little place for an early New Year’s dinner – Ristorante Toto – and it was amazing. Course after course of pure Italian indulgence: Antipasta; insalata verde; fried artichoke hearts; calamari; house made ravioli; perfectly grilled t-bone; and of course dessert… traditional profiteroles. And how can I forget to mention the champagne and bottle of Chianti Classico that we washed it down with. We spent a couple hours in this quaint little place. At the table next to ours was a kind Russian couple who were absolutely in love with Kai. They insisted on playing with him and holding him in between courses of food. And Kai was of course entertained by their friendliness and new voices. It was a wonderful dinner that marked the end of 2013, one of the best year’s of our life. After dinner, we continued to walk the streets of Firenze. Then we stopped into a small shop, grabbed a bottle of wine, and headed back to our hotel. 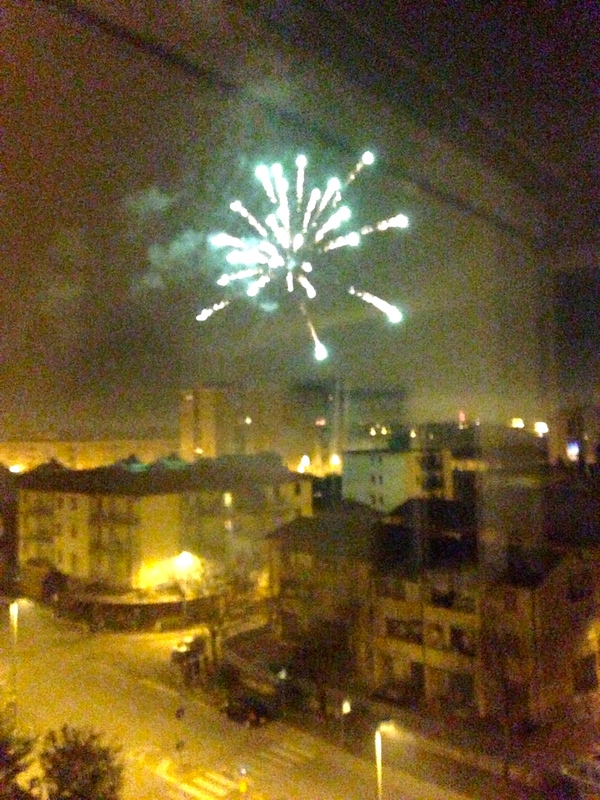 From the fifth floor of our hotel we watched the New Year’s eve fireworks that lit-up the Florence skyline at the stroke of midnight while sweet Kai slept peacefully next to us. It was a New Year’s eve we will remember forever. Many different paths can take one to the same goal. I think that reasonably sums up our time in Rome. Tourism abounds and is clearly at the core of the Roman economy. 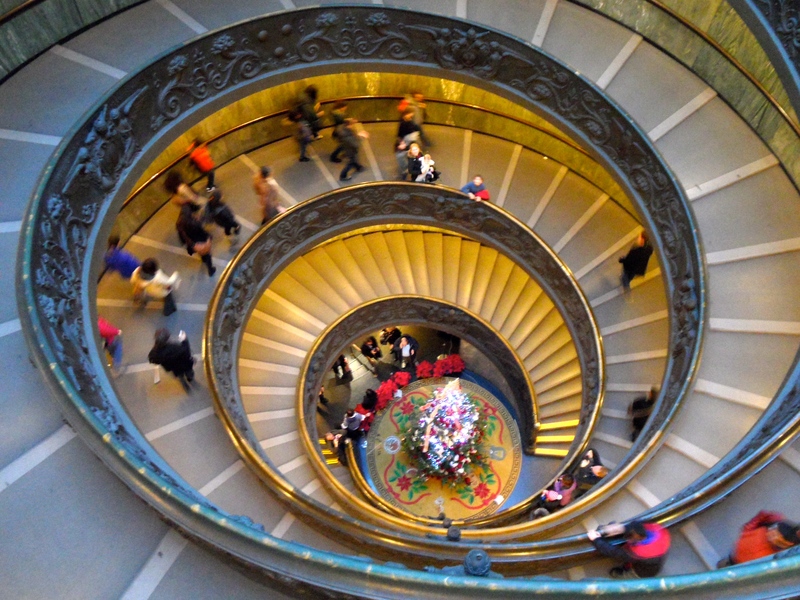 Somehow Rome retains its mystique amid the chaos of people who flock to iconic city center and wander along its ancient walls in search of secrets from a civilization past. You can so easily loose yourself in the grandeur of the Roman Forum and the Palatine Hill, and all the legends that are a part of the experience. My imagination gets the best of me and I am taken back in time. I wonder… does Kai also slip back in time with me? Without knowing the history, having read the books, or seen images of what life was like in ancient Rome, is it possible? Is there something innate within us that gives us the ability to ‘live’ history? One will never know. We walked and walked. 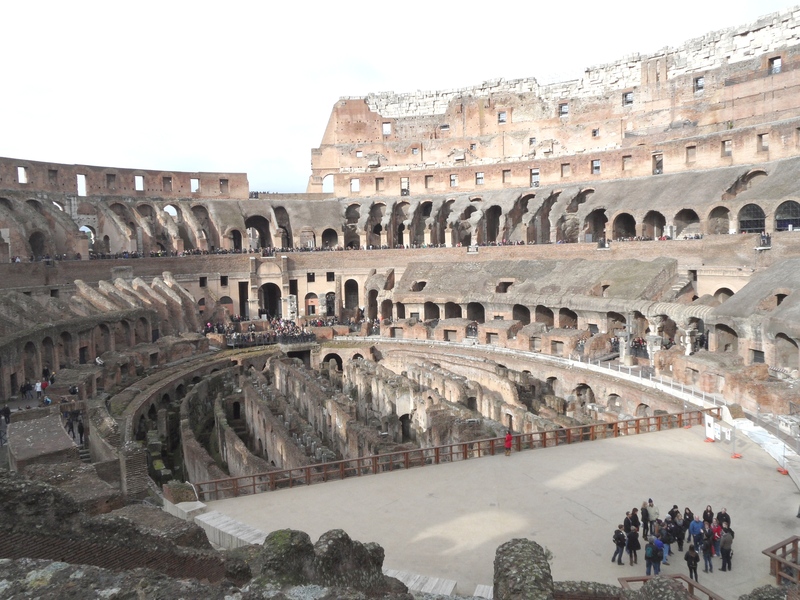 Explored the ubiquitous Roman Colosseum from the outside in. We felt the crevices of the cold smooth stone carvings with out fingers. Kai touched – and felt – everything we did. I even think he may have found an opportunity (or two) to taste the walls of the Colosseum, after all it is through the sense of taste that babies (and adults) experience the World. Just as the heavens opened up and brought down the rain, we found ourselves a quaint café for a dry lunch, warmth, and rest. I had my first real Italian lasagna and it was divine… followed by the most satisfying (and huge!) cappuccino a jet lagged Mama could ask for. And I got to savor every moment of the cappuccino as Kai decided to take his afternoon nap right there in the café, and my husband and I enjoyed good conversation (in Spanish) with a couple traveling from Germany. The sun came out. We walked and walked. 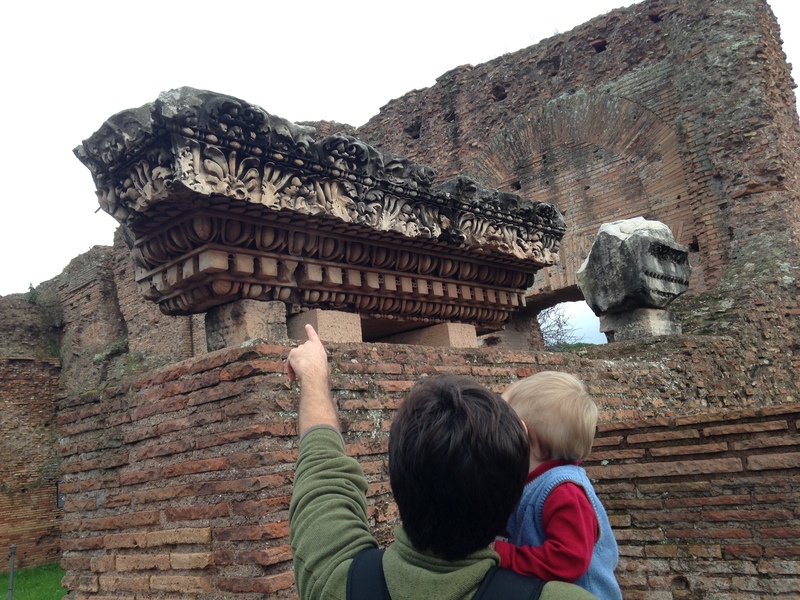 We pondered the half buried ruin throughout the expansive Palatine Hill, temples, and the Roman Forum. It was magical. We even took some time to play in a grassy knoll amidst the ruins. It was a lovely afternoon in Rome. One breathtaking moment after another. As the sun went down we walked and we walked. We continued past down the main roads where people posed in the most bizarre costumes and statue-like positions. Yogi that “magically” hold themselves cross-legged and floating mid-air. Perfectly poised people draped in gold spandex looking like the perfect Egyptian mummies. I can only imagine what is going through Kai’s mind. We proceeded past the Piazza Venezia adorned in much gold and the intricacies of more modern architecture. On some small cobblestone side road we found ourselves inside a truly ancient Church and it just happened to be evening mass. Then we headed to the Pantheon – the structure known as the temple to all of the Gods. We walked and we walked. Stopping in a dozen little shops selling everything from Italian spices and olive oil to Absinthe and leather bags. We walked all the way to Trevi Fountain where we stopped for a while. Kai was completely mesmerized by the statutes and of course the water all lit up against the night sky. Finally our adrenaline began to wear off and we realized just how exciting the day had been. We found our way back to the subway and headed towards the hotel. We had done enough for the day. 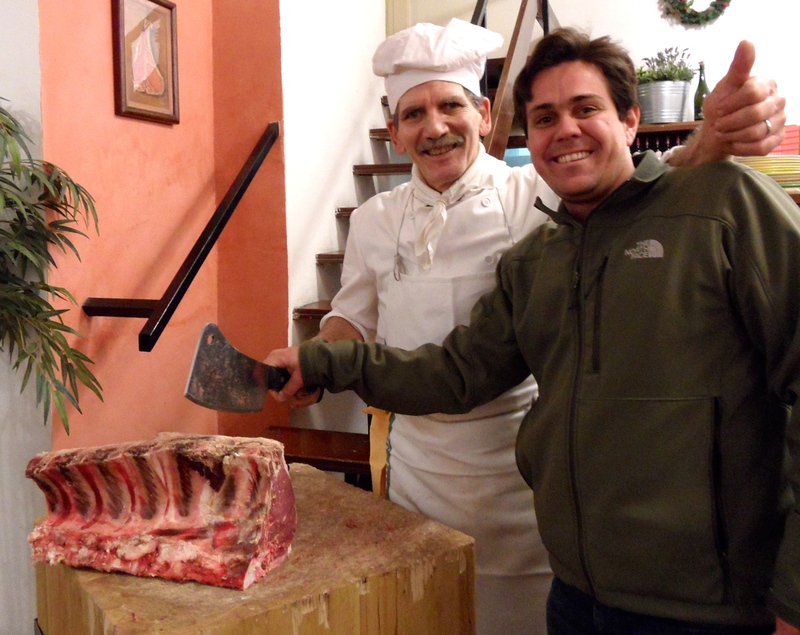 On our “home” to the hotel we stopped to see if our favorite family run Italian eatery was open – Osteria Gran Sasso. Much to our disappointment it was closed, so on we walked some more until we found our selves at the Ristorante Mimosa Fiorita. Kai loved this place too, and couldn’t get enough of the waiter and the chef. It was another r authentic and divine Italian indulgence. Freshly made cheesy risotto balls. Pork cheeks cooked in a delicate sauce. Fresh tagliatelle pasta with vegetables in the chef’s special sauce. And of course a half bottle of Chianti to wash it down. Another magical day in Rome came to a close. Welcome to the Dolci Vita! This is the first post in the series – Kai’s Travel Adventures. More to come! Some 10 hours after we departed cold Washington, DC we felt the plane hit the tarmac in none other than Rome, Italy. It was a cool December day and the sun was shining. Kai was bright-eyed and excited as he peered out the airplane window and marveled at the vista, he had no idea what lay ahead for the next 10 days. In fact none of us knew what would lie ahead, this was our first real adventure to an unknown land since Kai was born just 10 months ago. Just getting off the plane, I got a sense of the food that Italy had in store for us. 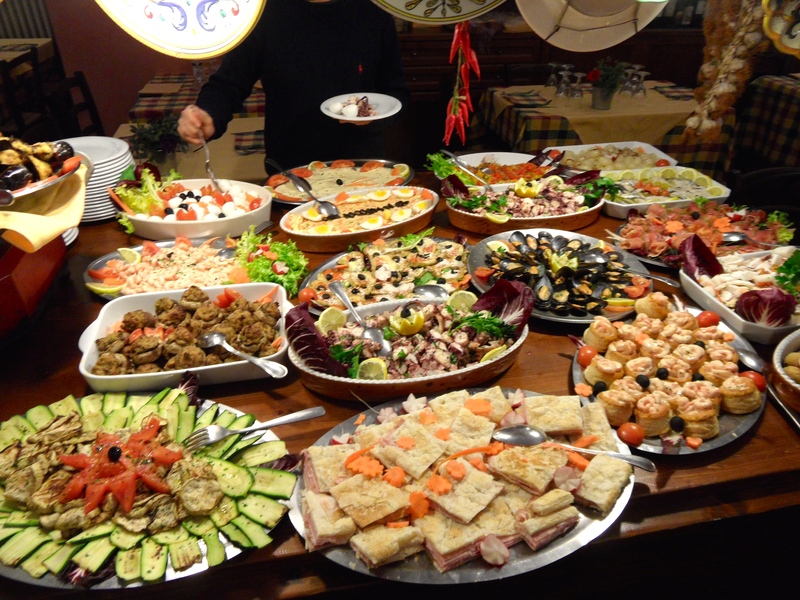 There was a picture perfect antipasta bar with fresh buffalo mozzarella, plump red tomatoes, white bean salad, and perfectly grilled fresh artichokes dressed with lemon. 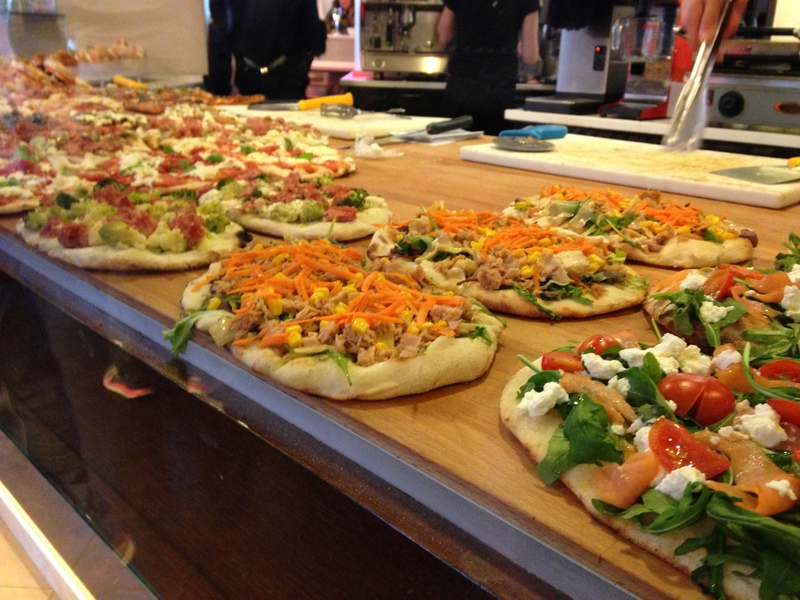 A food lovers dream come true! And this is just airport dining. We travelled light (which made it so much easier!) with one backpack for each of us (which included Kai’s stuff), plus Kai’s car seat & diaper back pack. So in no time we met our driver and headed across Rome to our hotel. The hotel (Villa Morgagni) was great, historic and very accommodating to families – we’d stay there again. 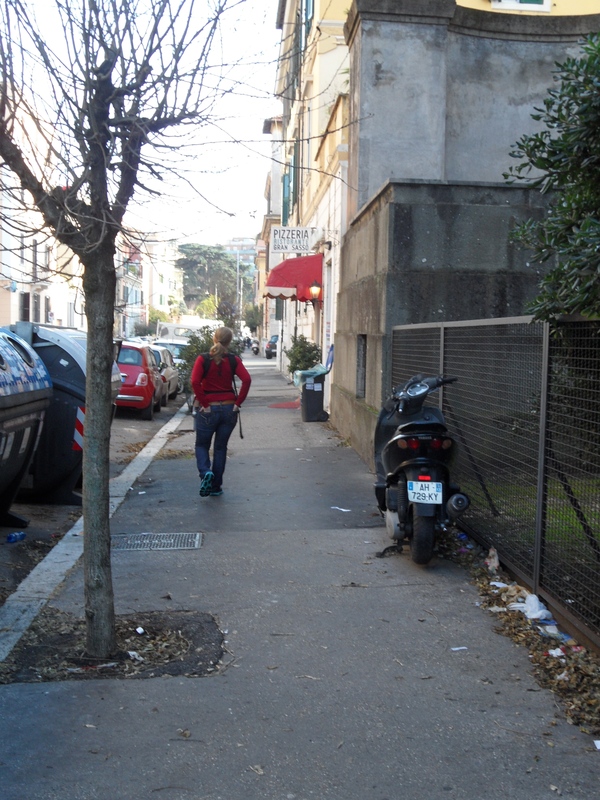 Despite the jet lag, we were so excited to be in Rome and were operating on adrenaline, so off we went by foot walking the streets of Rome. First we stopped for lunch at this amazing local restaurant that became our favorite eatery in Rome. We feasted on a plate of house made meatballs in marinera, giant prawns (with the head on! Yum!) cooked in garlic and sherry, and of course a caprese salad – simple and completely delicious! They don’t call Italy the ‘Dolci Vita’ (Sweet Life) for nothing! Our journey continued on foot towards city center, Kai was mesmerized by the all the new scents, people, new language, and really everything that we were just as equally fascinated by. It made me realize that we really aren’t any different after thirty than we are at just 10 months. We wandered and wandered, found ancient city walls dating back before Christ. Ancient stone churches in every niche of the city that are still operating today, with centuries of family tradition still attending weekly mass at the same churches their ancestors did. We made our way to the train station, got our Roma Pass’ and spent some time checking out the map and subway. Kai and I found a little kiosk selling nothing better than authentic gelato, and there in the chaos of the train station we devoured out first (of many) real Italian gelato. 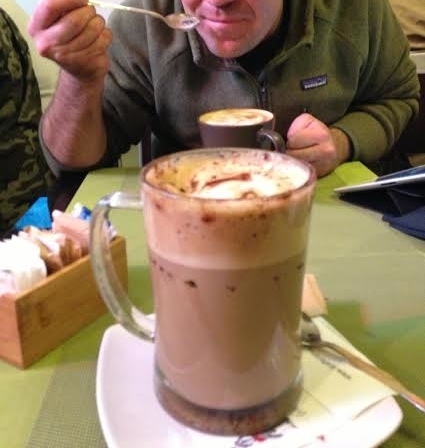 Yes, we literally ate our way through Italy… more to come on the food. 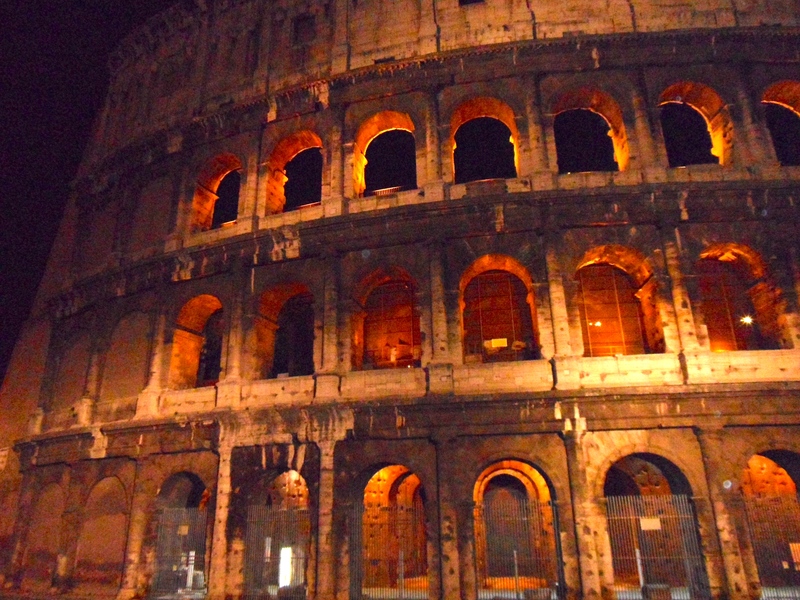 Then we headed to the iconic ancient Roman Colosseum right in the heart of Rome. In all its grandeur and magic. All its windows and crevices were lit up against the indigo sky just after dusk. 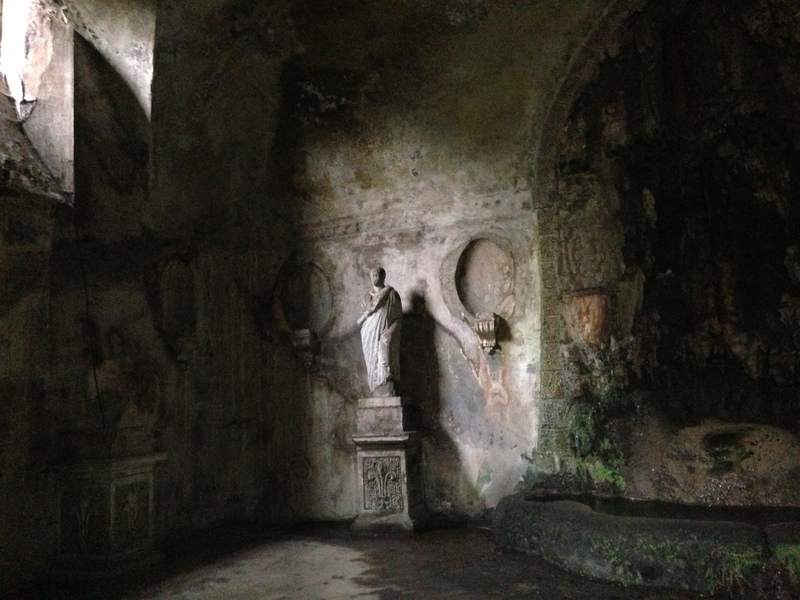 This is Rome… We were all breath taken. 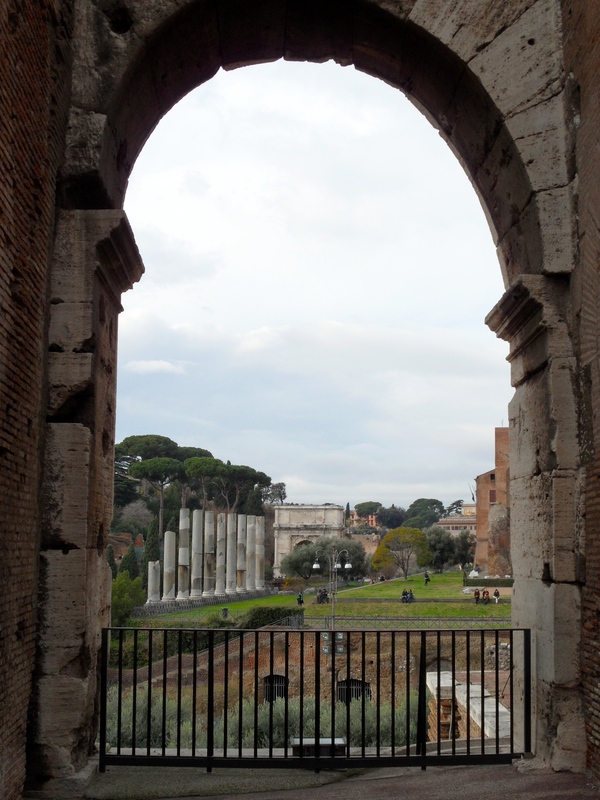 We strolled around the grounds of the Colosseum for a while, admired the Arch of Constantine, and a few of ruins in Palatine that were within sight. We knew the day ahead so much yet to be discovered. We headed back towards our hotel, grabbed a couple of glasses of Chianti and our first authentic Pizza, which was also divine! It occurred to me that evening as we found our way back to the hotel via subway that travel has a different meaning now than it had before baby Kai. Now traveling is more about showing Kai the world, its about guiding him in truly experiencing the world. He is also teaching me how to look at the world differently. I pick-up on the very things he marvels at, and in turn marvel with him at things that would otherwise be unseen. And with that, it was time to rest. More on Kai’s Italian Adventures to come!